I have a ton of news on the Color Club front! Wow. Walking into the Forsythe Cosmetics booth (the manufacturer of both Color Club and Ruby Wing) was like a candy store. There was a lot to see and learn. I have upcoming collections, new nail art kits, and breaking news on the future addition of two collections per year and Color Club's rebranding plans! This will be a long post, so I'll lead off with the best scoop first...the winter collection! This doesn't speak "holiday" to me, but it does scream "winter". I think I'll be able to wear most of these to work too. I want to use them all together. I'll have to start plotting a look! I'm a sucker for Navy and Grey. Plus, the addition of coral would make some beautiful nail art! The jury is out for me on Pearl District. I like the concept, but I fear it will clash with my skin tone. But I can't wait to try it! Color Club has a few new nail art offerings. These items have just popped up on the Color Club website. All will begin shipping to retailers in October, so it will be a few months yet until we can get them. Below are the three Masterclass Kits, which include everything you need to create a look. The three themes are (L to R) Gemology, Metal Shop and Geometry. 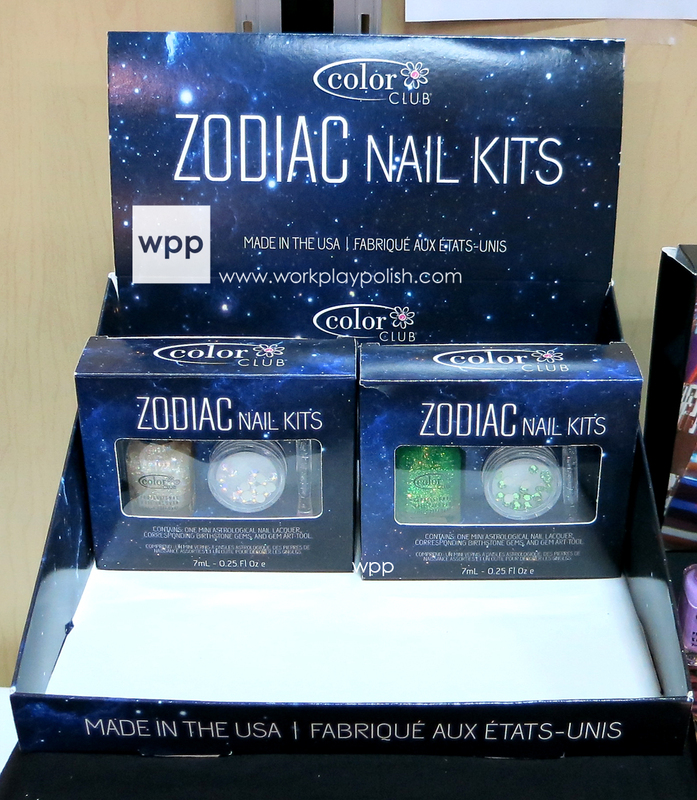 Below is the new Zodiac Nail Kits display. Each of the twelve kits (one for each astrological sign) will include a mini polish, corresponding birthstone gems, and a gem art tool (to help you pick them up and place them on the nail). The boxes below are mock-ups. In the final versions, there will be a round gemstone picture in the top left corner of the box so consumers can easily identify their birthstone. The Foilfilm Manicure Kits include 10 feet of foil film in two rolls, 1 foil adhesive, and two mini nail lacquers. Wow. That's a lot of manis! 120 inches of foil! There are six kits (listed after the pic). Starting in 2014...Six collections a year! 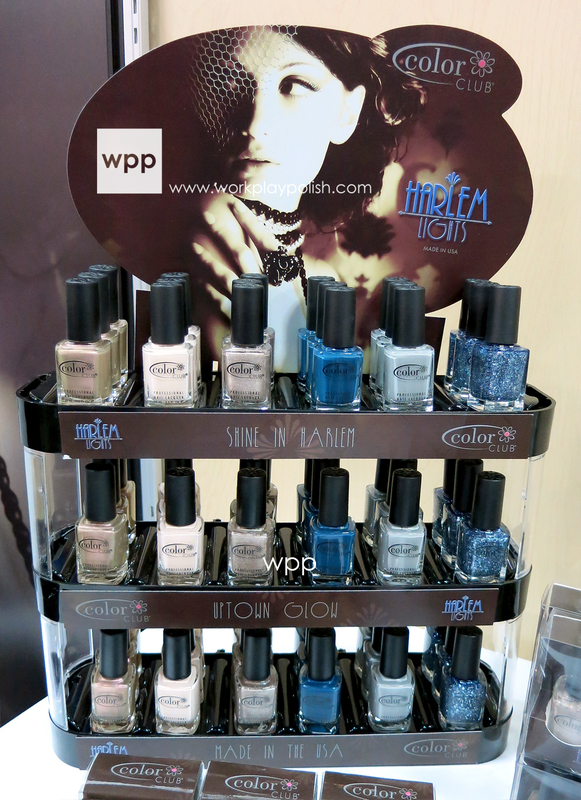 I was told that beginning in 2014, Color Club will release six collections per calendar year. This will include their four seasonal releases: Spring, Summer, Fall and Winter, as well as Resort and Back-to-School Collections. I know the Back-To-School release is intended to bridge the gap between Summer and Fall. I'm not sure if Resort will come out between Winter and Spring or Spring and Summer. I'll have to check on that. This news was really interesting to me. Forsythe Cosmetics has decided to give Color Club a small makeover and delineate two of their brands in a few ways. First, the Color Club line has a new look. The focus will be on a more sophisticated offering which will retail in higher end outlets. It will include nail art products and kits and will release all six collections each year. Below is the new logo. I'm not sure when we can expect packaging to transition to the new look. In addition, Forsythe Cosmetics will rejuvenate the Cosmetic Arts line, branding it as a "junior" line that's more youthful (and affordable). I believe it will retail in outlets such as Harmon, Ross, Christmas Tree Shoppes, Bed, Bath & Beyond and similar stores. Plans are for six Cosmetic Arts collections per year, as well. I know that was a lot for one post! Fun though, right? For more info, visit the Color Club website. You can also follow them on facebook, twitter, youtube, and pinterest.